One of the biggest benefits of saving and investing in a 401k is that it’s automatic – your employer just takes care of everything for you. Don’t you wish that investing in a Roth IRA could be that simple? Well, you can setup an automatic Roth IRA and make it easier to save for retirement – you just need to follow these simple steps. 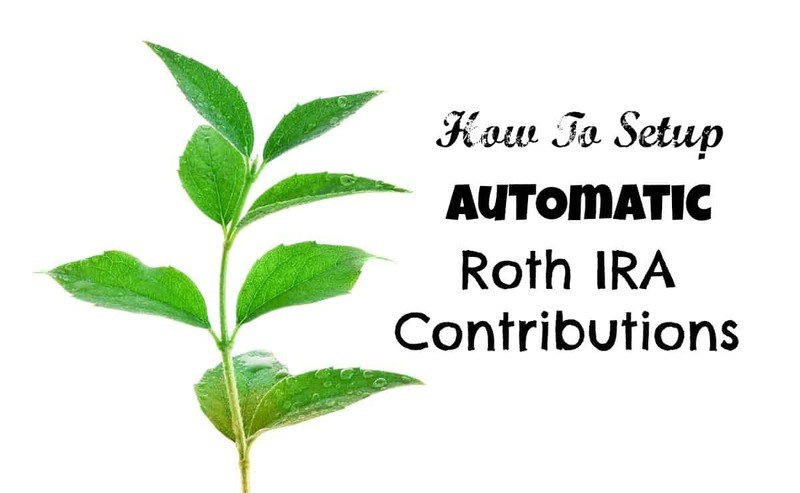 The other day we talked about when to open a Roth IRA (which is right now if you haven’t already), and today we’ll show you how to set it up to automatically contribute the max amount per year directly out of your paycheck! The first option, which is my personal favorite, is to setup automatic paycheck contributions to your Roth IRA. Almost every employer offers direct deposit, and when you set it up, you’re asked for your Bank Account Routing Number and Account Number. Then, each week your paycheck is deposited into your checking account. What a lot of people don’t realize is that you can setup multiple accounts to deposit money into. Some people already use this tactic to automatically save a certain amount of their paycheck each month – they simply have 10% automatically deposited into their savings account. Well, you can do the same thing with a brokerage account or Roth IRA. The trick is to figure out your broker’s Routing Number, and then your Account Number. On most websites, you can find this information by searching, but you can also find out by calling customer service. Once you have the routing number for your Roth IRA, you can setup automatic paycheck contributions each pay check. If your employer doesn’t offer direct deposit, or in the rare case you can’t setup multiple accounts, you can always do the process backward. Sharebuilder founded itself on having automatic investments, and you could set it up to automatically withdrawal a certain amount each week or month to invest. Now, almost every brokerage does this, and you can set this up for your Roth IRA. Simply go to your Roth IRA, go to transfers, and setup a bi-weekly or monthly transfer to take place after you get paid. Then, the money will automatically be transferred into your Roth IRA each pay period. The important thing to remember about this approach is that it isn’t based on your paycheck. So, if you are hourly and don’t work as much, or take an unpaid vacation, the automatic withdrawal will still process and it could impact your checking account balance. You really have to be more careful with this approach. The goal of this, of course, is to automatically invest the maximum possible to your Roth IRA. This does require a little bit of math on your part to make sure you get it right, because you don’t want to deal with the hassle of over-contributing. Do you automatically contribute to your Roth IRA or other brokerage account? Great tips for millennials looking to start contributing to a Roth IRA! It’s never too early to start contributing to a retirement account. Compound interest works in the favor of young workers and this age group will never have as much time again! See what options your employer has and consider opening up a Roth IRA in addition to a 401 (K). You can contribute to both at the same time and your Roth IRA contributions are made after taxes. Compound interest is great and it should be a motivating factor for starting young. Thanks for stopping by and sharing your thoughts! My question is what if you set up an IRA with Edward Jones and Wells Fargp. what are the rules there? The rules are the same. You just need to find the routing number and account number to setup the deposit. Would I be able to have my entire paycheck deposited into the IRA and then withdraw a certain amount for paying bills? Theoretically yes, since you can always withdraw your contributions from a Roth IRA – but it could be a hassle to keep track of it and most IRAs don’t make the withdraw part easy. im confused about what to do once you open the roth IRA ! is your money automatically invest or do i personally have to choose the stocks, etfs, bonds, etc? Yes, once you open the Roth IRA, you need to pick your investments within the account. Otherwise, your money just stays in cash.